before the Senate subcommittee on communications in defense of public television, transforms a clearly skeptical Senator Pastore from, "Alright Rogers you've got the floor" to, "Looks like you just earned the 20 million dollars." How does he accomplish this transformation? One line from Senator Pastore gives us some insight. Several minutes into Mr. Rogers testimony he says, "This is the first time I've had goosebumps in the last two days," to which Rogers graciously responds, "I'm grateful, not only for your goosebumps, but for your interest in our kind of communication." What are goosebumps in this context? They represent a form of activation not in the higher cortical or "thinking" centers of the brain but in the lower limbic, or "feeling" centers of the brain. The raising of the hairs on his body reflect Senator Pastore literally feeling his response to Mr. Rogers words. Rogers opens by saying that rather than read his statement, he prefers to just talk. He tells Senator Pastore, "I trust you" [to read it.] For the next 5 minutes he describes how his television program helps young children to name and manage their big feelings. The significance of the interaction lies as much in his direct gaze, his gentle tone, and the lilting rhythm, or prosody, of his voice as in the content of the words themselves. I raised this story, that is shown in the recent film "Won't You Be My Neighbor" over dinner with Dr. Bruce Perry, child psychiatrist and trauma specialist, who was spending the weekend with an extraordinary group of fellows in the University of Massachusetts Boston Parent-Infant Mental health program, where I am on the faculty. Dr. Perry was among the first to call attention to the significance of the Adverse Childhood Experiences study as evidence that our early experiences exert profound effects on our long-term health, both physical and emotional. We need to keep reminding everyone of the complexities of development and the importance of acknowledging individuals as unique. Relational health is more influential on health outcomes than adversity. ACEs are not actionable (unless ongoing). Relational poverty is.. The story of Mr. Rogers and Senator Pastore demonstrates how we change the way we think and behave when we feel something in the context of a relationship. Simply giving information is usually insufficient to effect change. We can also view this interaction in the context of the work of Dr.Ed Tronick, world-renowned developmental psychologist and chief faculty of the UMass Boston program. From his decades of research using the Still-Face paradigm, evidence emerged that growth and change happen through the process of mismatch and repair in everyday interactions. At the outset, Mr. Rogers and Senator Pastore were clearly mismatched, with wildly different intentions and motivations. In that "moment of meeting" they moved through mismatch to repair. The result was significant growth- in the form of salvation of what at the time was a new concept of public television. Dr. Perry's research has demonstrated that current relational health is the single best predictor of health outcomes. One of the fellows in the IPMH program described a group process for parents in her clinical work. They met together several times in a group setting, both before and after filling out their ACE questionnaire. At one of these meetings they focused on identifying positive, healthy relationships in their lives. They create what they term a map of resilience. Perhaps most importantly, the group itself becomes a current positive relational experience. The ACE study has profound implications for a wide range of settings. But before we rush to implement universal ACE screening in healthcare, we need to recognize the limits of information in effecting change. When we connect in relationships at the level of feelings, not simply words, meaningful change occurs. Jane’s story offers an example. A new mom, she had experienced intimate partner violence during her pregnancy and had troubled relationships with her own parents, both of whom were alcoholics. I learned this information not in a screening but in conversation with her. At our first meeting she shared her worry that her baby would be a “stranger.” Haunted by the cultural image of perfect bonding at the moment of birth, she was able to express her fears in the 20 minutes we spent in the hospital getting to know her son Aaron. When I saw Aaron with Jane in a visit a few weeks later, tears filled her eyes and her voice cracked as she said, “I can say to him ‘I love you’ and I know I really mean it.” With opportunity to tell her story in her relationship with me, she moved through mismatch to repair in her relationship with her infant son. Information about her ACE score took a back seat to moments of connection- between Jane and me and between Jane and her son. For professionals, the ACE study provides a critical frame to "inform" the way we listen to the story. 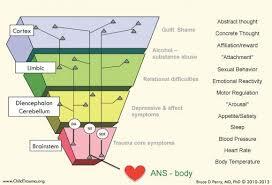 But this frame does not translate into giving patients information about the effects of trauma on long-term health. Without sufficient relational support, such information might be deeply destabilizing. In a previous post I suggest we replace the word "screening" with the word "listening." Screening is something you give to someone while listening is something you do with someone. As Dr. Perry shows, current relational health buffers against adversity. Offering space and time for the kind of connection we observe between Mr. Rogers and Senator Pastore may be just the "action" that is needed.